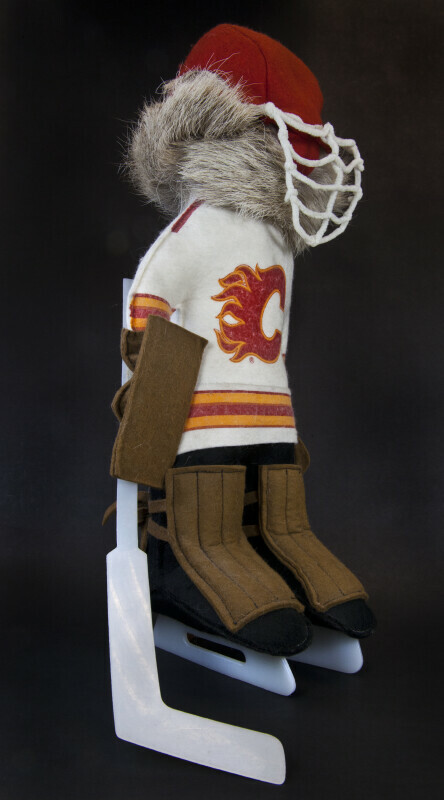 The three-quarter view shows the goalie's skates and hockey stick, which are made from plastic. The gloves and body guards are made from felt. His body is stuffed material, covered by felt, and his hair is reindeer fur. The emblem on his chest is for the Calgary Flames, a professional ice hockey team based in Calgary, Alberta, Canada. This figure stands 16 inches (41 cm) tall.